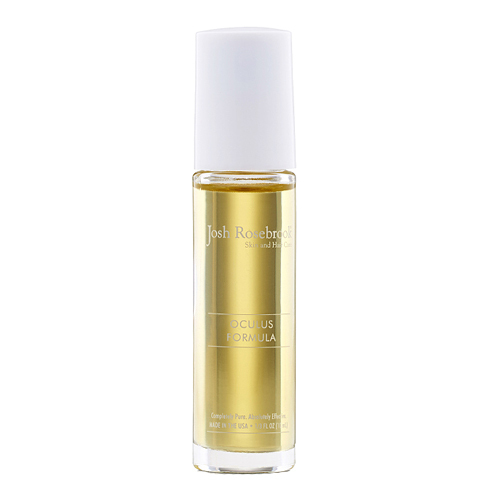 The Josh Rosebrook Oculus Formula is a unique blend of blueberry, neem, hemp, eyebright and slipper elm that lends a softened and smoothed feel to the skin around the eyes. This super lightweight and non-greasy eye brightening serum delivers a sense of protection to the delicate skin around the eye from antioxidants and essential fatty acids. This day or night essential dispenses the perfect amount of serum thanks to the easy to apply rollerball applicator on the bottle. Apply as a daily and nightly eye serum to a clean face. Gently roll under eyes, along the nasolabial folds (laugh lines), and anywhere you'd like to diminish the look of lines and wrinkles. Store product in a cool, dark place. Refrigeration is encouraged to maintain optimum freshness. Josh, you've done it once again! This is a beautiful eye oil and has literally changed the way I feel about my under eye area. It's super fast absorbing and sits beautifully under foundation. I no longer look dry and tired! I cannot get enough of this oil, I don't even use a moisturizer anymore. Going to try and keep it in the fridge per BH's directions too! How can I give this product 6 stars? !